For years and years, I couldn’t understand why teachers from all the different ballet classes that I had been attending kept harping on my ballet posture placement. They either use both hands to adjust my hip, scratch my hip flexor area, or kept shouting at me to keep my stomach in, or ribs in or a “short stomach”. For many frustrated minutes, I would stare at my other ballet classmates at their torso area. I couldn’t figure out why I was the only one getting this correction. Did all these ballet teachers from different studio have some internal communication network? Why do they all say the same thing to me? I didn’t have the ballet eyes then (mine has since grown in power in terms of observation skills) so I was baffled. I couldn’t figure out what was wrong with my placement, I couldn’t figure out what is wrong with me (compared to the rest!). Until I had the opportunity to be trained by an South African ex-pro-dancer and now mentor senior teacher. She simplifies it down to what she calls the PENCIL TEST. You should be able to place a pencil flat against your pelvic/hip bone at the area where it is connected to the thigh. Place the middle of the pencil where it bends (like when you sit). So, the test is that the pencil is flat against your body. It should be this shape “|” and not “<“. Now, some of you may achieve this right away. If you are like me, who kept getting corrected, it could be because you’ve been sitting too much, resulting in a tightness in the pelvis area. 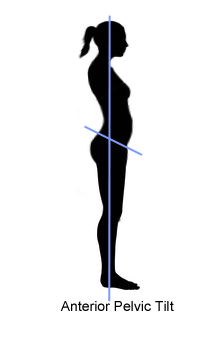 I had an anterior pelvic tilt like this picture below. You would need to do some stretches, or deep tissue massages, foam rolling to release the tightness in order to have an easier time attaining the right ballet posture. Hope you find the ballet pencil test tip useful!